The Central Board of Direct Taxes (CBDT) has notified the Income-tax Return (ITR) Forms applicable for the Assessment Year 2018-19. These ITR Forms will be applicable to file income-tax return in respect of income earned during the period 01-04-2017 to 31-03-2018. The new forms incorporate the changes made by the Finance Act, 2017 in the Income-tax Act, 1961. It is apparent that the new ITR Forms have shifted the entire onus on the taxpayers to prove their claim for deductions, expenses or exemptions. This year the ITR forms seek lot of new information from taxpayers who opted for presumptive taxation scheme, in respect of capital gains from unlisted shares, transactions with registered and unregistered suppliers under GST, so on and so forth. A. Every listed and unlisted company (other than NBFC) whose net worth is Rs. 500 crore or more as on March 31, 2014 or any subsequent date [applicable from April 1, 2016]. B. An unlisted company whose net worth is Rs. 250 crore or more but less than Rs. 500 crores as on March 31, 2014 or any subsequent date [applicable from April 1, 2017]. Though the high net-worth companies (listed in category A above) were required to prepare the first Ind AS compliant financial statement for the year ending March 31, 2017, but the ITR forms for Assessment Year 2017-18 were not requiring any specific information from these companies. This year, the ITR 6 introduces a new Schedule for Ind AS Compliant companies wherein they shall be required to disclose the balance sheet and profit & loss account in the same format as prescribed under Division II of Schedule III to the Companies Act, 2013 (i.e., Ind AS Financial Statements). Further, the Finance Act, 2017 inserted new sub-sections (2A) to (2C) in Section 115JB with effect from Assessment Year 2018-19. The new provisions require Ind AS compliant companies to make additional adjustments to the book profit for all items credited and/or debited to "Other Comprehensive Income" and all other items specified therein. The form ITR 6 now incorporates the necessary changes to enable the Ind AS Compliant companies to calculate the book profit in accordance with new provision. Up to Assessment Year 2017-18, if assessee fails to file the return of income before the end of the assessment year, penalty under Section 271F may be imposed by the Assessing Officer. This penalty provision was omitted by the Finance Act, 2017. A. Rs. 5,000 if return is furnished after the due date but before December 31 of the assessment year [Rs. 1,000 if total income is up to Rs. 5 lakhs]. B. Rs. 10,000, in any other case. After introducing this new provision, the assessees shall now be required to pay the late filing fees under section 234F along with interest under section 234A, 234B and 234C before filing of return of income. The Income-tax Dept. shall not be required to initiate the penalty proceedings separately to levy such fees on late filers. Relevant changes have been incorporated in the new ITR forms wherein a new row is added to enable the assessee to fill the details of late filing fees. It seems that ITR 1 and ITR 4 don't remain Sahaj and Saral. Up to last year, an assessee was required to mention only the taxable figure of salary income and income from house property in these ITR forms. The new ITR forms require the individual assessee to provide detailed calculation in case of salary & house property income. Taxpayers opting for presumptive taxation scheme under section 44AD, 44ADA or 44AE are not required to maintain books of account. They are required to file return in Form ITR 4. The old ITR 4 sought only 4 financial particulars of the business, a) total creditors, (b) total debtors, (c) total stock-in-trade and (d) cash balance. The new ITR 4 form seeks more financial details of business such as amount of secured/unsecured loans, advances, fixed assets, capital account etc. Further, new ITR 4 seeks GSTR no. of the assessee and turnover as per GST return filed by him. All citizens who are domiciled in Goa and to whom the Portuguese Civil Code of 1860 is applicable are governed by the system of Community of Property. Under this system, a person is entitled to inherit 50%of the property of his spouse and income therefrom is also liable to be shared equally among the spouse. Under Section 5A, the statute has recognised the system of community of property for the purpose of assessment in respect of all the income other than salary. In this situation, if an income, which is added to the common pool, has been subjected to TDS, the assessees face difficulties in proving their claim for TDS Credit. There are other similar situations, where a person is entitled to claim the credit for tax deducted in the name of another person, i.e., inheritance, etc. Currently, Income-tax Dept. matches the TDS disclosed in ITR with the amount of TDS as shown in Form 26AS and in case of mismatch, the Dept. asks the assessee to reconcile the mismatch. Therefore, in the situations as mentioned above, the taxpayers were facing difficulties in claiming the TDS credit. To overcome this problem, the ITR forms introduce new columns in TDS Schedule which would allow Dept. to easily correlate the PAN, amount of income and TDS thereon as disclosed by both the parties in their respective return of income. It would make it convenient for the assessee to claim the credit of tax deducted in name of another person. The Finance Act, 2017 introduced a new Section 50CA with effect from Assessment Year 2018-19.This new provision provides that if unlisted shares are transferred at a price which is less than its FMV, the sales consideration shall be deemed to be the price as calculated by a Merchant Banker or a CA on the valuation date. Erstwhile provisions of Section 56(2)(vii) were applicable only to an individual and HUF. It provides that any sum of money or any property received by an individual or HUF without consideration or for inadequate consideration (in excess of Rs. 50,000) shall be taxable as income from other sources. The Finance Act, 2017 had extended the scope of this provision by introducing a new clause, i.e., Section 56(2)(x) which covers all taxpayers within its ambit. Consequently, new columns have been inserted in all ITR forms except ITR 1 and ITR 4 under 'Schedule OS' to report any income as specified in Section 56(2)(x). Up to last year, an individual or an HUF who is a partner in a firm can use ITR 2 to file its return provided he does not have any income from proprietorship business. In case partner also earns income from his own proprietor business or profession, then return had to be filed in Form ITR 3. The ITR 2, as applicable up to Assessment Year 2017-18, had a Schedule IF which requires the assessee to provide the information about the partnership firm. Now for the Assessment Year 2018-19, an individual or an HUF, who is a partner in a firm, shall be required to file his ITR in Form ITR 3 only. The CBDT vide Income-Tax (Twenty Ninth Amendment) Rules, 2016, dated 07-11-2016 had restricted the highest rate of depreciation for any block of asset to 40%. In other words, all block of assets which were eligible for depreciation at the rate of 50%, 60%, 80% or 100% would be eligible for depreciation at the rate of 40%. The new ITR Forms have replaced the depreciation column of 50/60/80/100 percent with 40% in case of plant & machinery and Building. New columns have also been inserted to enable the entities to claim proportionate depreciation in the event of business reorganisation, i.e., demerger, amalgamation, etc. Further, a field is added to disclose the disallowance to be made in respect of depreciation under section 38(2) if an asset is not exclusively used for business purpose. The new ITR Forms introduce specific columns to report each capital gain exemption separately. Details of each capital gains exemption under Sections54, 54B, 54EC, 54EE, 54F, 54GB and 115Fshall be reported in its applicable column now. Further, a taxpayer availing these capital gains exemptions is required to mention the date of transfer of original capital asset which was missing in earlier ITR Forms. The provisions of Section 40(a)(ia) disallow 30% of certain expenditures if tax is not deducted in respect of those expenditures in accordance with Chapter XVII-B or if tax is deducted but not deposited on or before the due date for filing of return of income. The Finance Act, 2017 introduced the similar disallowance provision in case of income from other sources if tax is not deducted or not deposited in accordance with Chapter XVII-B. 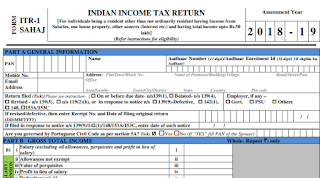 A new column has been inserted in the ITR Forms to report such disallowances. As per section 41(1), if a business entity recovers any amount in respect of an allowance or deduction by way of remission or cessation thereof, the amount so received shall be deemed to be the business income and chargeable to tax. There is a similar provision in respect of an expense which had been claimed as deduction against an income chargeable to tax under the head 'Income from other sources'. The new ITR forms require separate reporting of such remission or cessation, which is taxable as per Section 59, in Schedule OS. Carbon credits is an incentive given to an industrial undertaking for reduction of the emission of Green House gases, including carbon dioxide which is done through several ways such as by switching over to wind and solar energy, forest regeneration, installation of energy-efficient machinery, landfill methane capture, etc. Carbon Credits are issued as Certified Emission Reduction (CERs) by the UNFCCC. Credits can be exchanged between business entities or bought and sold in international markets at the prevailing market price. The Finance Act, 2017 had introduced a new section 115BBG to provide that any income from transfer of carbon credit shall be taxable at the concessional rate of 10% (plus applicable surcharge and cess). No expenditure or allowance shall be allowed from such income. New ITR forms make consequential changes to report the income earned from carbon credits and tax thereon. In earlier ITR Forms, net impact of ICDS on the profit or loss of the assessee was required to be reported. In other words, only impact of ICDS on the profits (whether negative or positive) was reported in Part A of OI (Other Information). The new ITR Forms require separate reporting of both profit and loss (and not on net basis) in Schedule OI, Schedule BP (Computation of income from business or profession) and Schedule ICDS. After enactment of GST Act, the new ITR forms have introduced new columns to report CGST, SGST, IGST and UTGST paid by, or refunded to, assessee during the Financial Year. 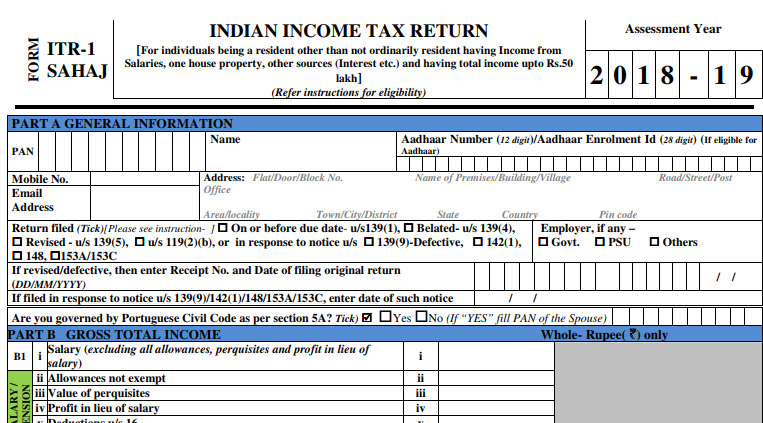 Individual taxpayers who are filing income-tax return in Form ITR 2 or ITR 3 or ITR 4 aren't required to mention the gender, i.e., male or female or transgender, as the column of gender has been removed. The new ITR forms allow non-residents to furnish details of any one foreign Bank Account for the purpose of payment of income-tax refund. Corporate Social Responsibility (CSR) expenditures are to be incurred mandatorily under the Companies Act, 2013 and these expenditures are not deductible under section 37(1) of the Income-tax Act, 1961. All the companies which are covered under Section 135 of Companies Act 2013 are required to disclose CSR expenditure during the year in its Board's report. A new column has been inserted in ITR Form 6 to provide details of apportionments made by the companies from the net profit for the CSR activities. A new schedule has been inserted in the ITR 6 wherein breakup of payment & receipts in foreign currency are required to be reported by an assessee who is not liable to get its accounts audited under section 44AB. Assessees are required to provide the details of payment made and sum received in foreign currency towards capital and revenue account. A. Aggregate annual receipts of the projects/institutions run by the trust. However, the table asking details about the name and annual receipts of institutes covered under Sections 10(23C)(iiiab), (iiiac), (iiiad) and (iiiae) has been removed. C. Amount utilized during the year for the stated objects out of surplus sum accumulated during an earlier year. Section 12A provides for conditions to be satisfied by a charitable institution for availing of exemption under sections 11 and 12. A new clause (ab) has been inserted in Section 12A(1) with effect from Assessment Year 2018-19 to provide that where a charitable institution has been granted registration and, subsequently, it has adopted or undertaken modification of the objects which do not conform to the conditions of registration, it shall be required to take fresh registration. B. Whether application for fresh registration has been made within stipulated time period? C. Whether fresh registration has been granted? D. Date of such fresh registration. Section 115BBDA provides for levy of additional tax on dividend income received from domestic companies, if it exceeds Rs. 10 lakhs in aggregate. When this section was introduced by the Finance Act, 2016, this additional tax was levied only on resident Individual, HUF and Firms. The scope of this section was extended by the Finance Act, 2017 by levying the additional tax on all resident taxpayers except a domestic company, funds or instructions as referred to in Section 10(23C) and a trust registered under Section 12A or 12AA. The changes made by the Finance Act, 2017 are applicable from the Assessment Year 2018-19. Accordingly, necessary changes have been incorporated in Form ITR 7 which is applicable for Assessment Year 2018-19. All dividends in excess of Rs. 10 lakhs which are taxable under Section 115BBDA shall be disclosed in the Schedule OS (Income from other sources) and Schedule SI (Income chargeable to tax at special rate). Up to Assessment Year 2017-18, a donation made by a registered trust to another registered trust constituted application of income notwithstanding that the donation was made with a specific direction that it shall form part of the corpus of the donee. The Finance Act, 2017 has inserted a new Explanation 2 with effect from Assessment Year 2018-19 to effect that any donation to another charitable institution registered under section 12AA with a specific direction that it shall form part of the corpus of the donee, shall not be treated as application of income for charitable or religious purposes. The consequential changes have been made in form ITR 7. In Schedule TI(Statement of Income) all the corpus donations made by a trust to another registered trust shall be added back to the taxable income of the donor trust. Registered political parties are exempt from income-tax by virtue of section 13A of Income-tax Act. Earlier there was no restriction on the political parties to receive the cash donations. However, with effect from assessment year 2018-19, Section 13A puts a restriction on political parties against receiving the cash donations in excess of Rs. 2,000. A political party will lose its tax exemption if donation exceeding Rs. 2,000 is received other than by an account payee cheque or draft or ECS or electoral bonds. The new ITR 7 requires the political parties to provide a declaration by selecting the 'Yes' or 'No' check-box to confirm whether it has received any cash donation in excess of Rs. 2,000. A political party is now required to disclose more information about the auditor who is signing the audit report of the political party.